Happy Kitchen Sink Stamps Monday! Thanks for stopping by, I hope you had a great weekend! We went from near 70 degrees on Friday to mid 30's and snow flurries for the weekend! So much for Spring! I remember last April we got a Spring Snow Storm and the boys were able to take the snowmobiles out, I sure hope that won't be the case this year! With Easter quickly approaching, I thought the Multi Step Little Lambs from Kitchen Sink Stamps would make a cute Easter Card. The images were stamped in reverse order as follows: #5 Memento Black, #4 Memento London Fog, #3 Memento London Fog stamp off, #2 Stampin' Up! Sahara Sand, #1 Stampin' Up! Sahara Sand stamp off. The sentiment is from Kitchen Sink Stamps Ready 4 Any Holiday. Oh my they are too sweet. What a fun stamp set. I love the realistic looking animal stamps. Great Easter Card. Perfect Easter card, luv the lambs, and the colors you used. How can Easter be here already?!! 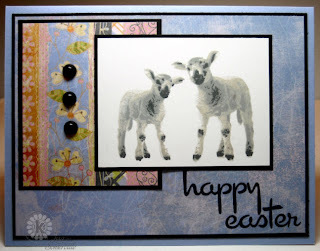 Such a great Easter card with this sweet pair of lambs!! What beautiful work, Lisa!! Brrr, I'm not liking the cold weather either. Great Easter card, perfect with the little lambs. Sweet lambs, Lisa!! I love the black layers you added. Beautiful work!! Those lambs are just darling! Wonderful card! Great Easter card...just love those little lambs! And Easter is just the perfect time to use those stamps, isn't it?!! These Muti stamps look wonderful as does this wonderful card. Thank you so much for stoppin by my blog and leaving a lovely comment too.